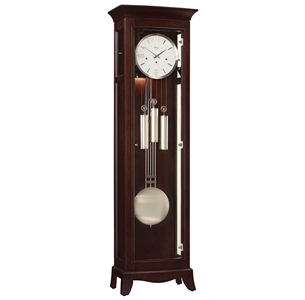 This handsome transitional clock features a Manhattan finish on select hardwoods and veneers with a flat top pediment and gently curved bowed front complete with a curved glass door framed with bead molding. The curved glass front door features nickel hinges and door pull. The brushed nickel finished grid pendulum is complemented by brushed nickel finished weight shells. Removable upper side glass panels allow convenient access to the movement. A bowed base, featuring graceful arched legs, supports the clock. Adjustable levelers under each leg provide stability on carpeted and uneven floors. Free engraved brass plate is included.